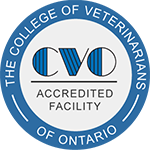 Dr. Emily Jantzi , B.Sc., DVM, C.O.A.C. To complement the practice Alan has become one of the few veterinarians in Canada with FEI designation status, most recently attending the Pan Am Games in October 2011 as the team veterinarian for the Canadian Dressage Team. Outside of the practice, Alan devotes his time to his wife and two children, and avidly pursues hockey, snowmobiling, skiing, riding & kiteboarding. Many of you have noticed a new but not unfamiliar face showing up at the barns these days, and while she has been working for a couple months now, here's the official welcome!! Manning Equine Veterinary Services is excited to welcome our newest associate, Dr. Paige Manning. Growing up with a vet clinic and sport horses in the back yard, Paige developed a passion for horses at a young age which extended to equine medicine following years spent riding along on calls with Alan. Following graduation from the Ontario Veterinary College, Paige completed an internship in Large Animal Medicine and Surgery at the Atlantic Veterinary College where she developed an interest in internal medicine and lameness. The diagnoses of lameness issues, GI problems and reproduction are all areas she has a keen interest in. Paige looks forward to renewing friendships and contacts in the practice as she joins Alan & Emily in helping Manning Equine continue to provide clients with the high level of care, compassion and services they have come to expect from us. Dr. Emily Jantzi, B.Sc., DVM, C.O.A.C. Dr. Emily has had an inexplicable passion for horses for as long as she can remember. Growing up in rural Ontario close to Waterloo, she quickly traded in her ballet slippers for blundstones, and never looked back. She completed a Bachelor of Science in Animal Biology at the University of Guelph, followed by veterinary school at the Ontario Veterinary College. Emily has a keen interest in equine sports medicine as well as reproduction and dentistry and is certified both as an Equine Chiropractor, an FEI Treating Veterinarian, and an FEI Delegate Veterinarian. Sitting astride a horse before she could walk, Berit’s love of horses drove her to many avenues of horsemanship before focusing on the hunter/jumper discipline. Berit pursued her passion for horses into Sheridan College where she studied to be a veterinary technician, earning her certification as a Registered Veterinary Technician in 2014. Berit works closely with our veterinarians on the road and on in-clinic procedures. Cora has been part of the equine industry for the past twenty years, working in and managing large stables for most of her adult life. A certified elementary school teacher, Cora enjoys developing young horses when she is not in the classroom. Cora joins our technical team assisting veterinarians on the road with farm calls. Mercedes started riding at the age of 7 and was buying, selling and retraining horses by the time she graduated high school. She has diversified her knowledge by working with competitive equine professionals Ute Busse (Dressage) and Sergio Campos (Jumpers). Mercedes complements our clinic staff with her riding experience developing our young horses and working with our rehabilitation patients. A constant lover of horses, Erin started riding at age 11 and has worked full time in the horse world since her early 20s. She has worked throughout the thoroughbred industry and has shown her own thoroughbred hunter on the “A” circuit. Erin is part of our office team as an Administrative Assistant. The backbone of Manning Equine, Sue is our Practice Manager. Having met Alan while completing her Microbiology degree from the University of Guelph, Sue has been an intricate part of our practice since its inception in 1998 and can often be seen admiring the foals in the spring or walking with her dogs around the beautiful clinic property.